Two separate acts have been named joint winners of the Edinburgh Comedy Awards for the first time in the history of the city's Fringe festival. 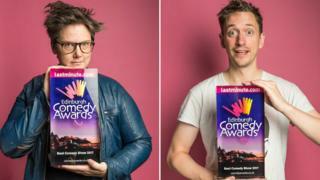 Australian comedian Hannah Gadsby's show Nanette shares the Best Comedy Award with British stand-up John Robins' The Darkness of Robins. The winners saw off competition from seven other nominees, including Ahir Shah, Sophie Willan and Spencer Jones. The comedians will each receive £10,000 in prize money. Mr Robins' show focused on the end of his relationship with fellow comedian Sara Pascoe, while Ms Gadsby said Nanette would be her last outing as a stand-up. Awards director Nica Burns said the decision to have two winners was "fitting that in the 70th anniversary year of the Fringe something extraordinary has happened". He added: "Both shows, which could not be more different, were hotly debated and fiercely fought for. "Comedy has many possibilities and audiences [have] very different funny bones. These two incredibly talented winners make you laugh and touch your heart. "And yes, they will both receive £10,000 each so it's been an expensive year. In the 37 years of the lastminute.com Edinburgh Comedy Awards this has never happened before and it is unlikely it will ever happen again." LA-based Natalie Palamides won the Best Newcomer Award and £5,000 for her show LAID - a dark comedy about a woman who lays an egg every day and has to decide whether to raise it or eat it. The judges decided not to award the annual Panel Prize.